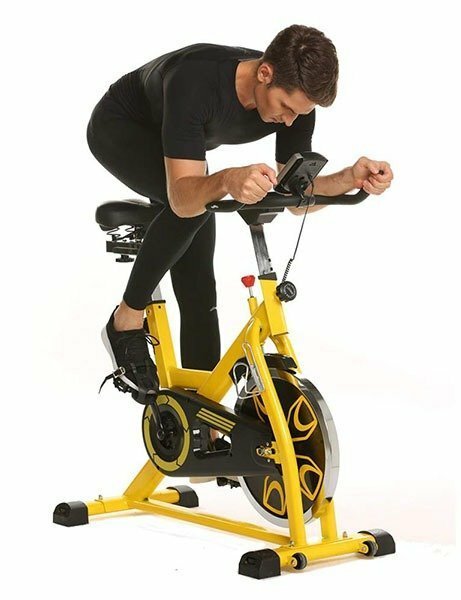 Thanks to the mass use and satisfaction of indoor exercise bikes, I’ve decided to put together an ultimate review of the Aceshin indoor exercise bike. Aceshin is a well established brand that produces all kinds of equipment and they do not limit themselves just to sporting accessories. They manufacture inline skates, water transfer pumps, elliptical machines, exercise bikes, electronic safes, toys and even furniture. Generally they are a well regarded brand. But we are not her to review safes or toys; we are here to take a closer look at Aceshin indoor cycling bike. So let’s start with the features. The bike is made of heavy-duty steel frame and features one heavy 49 pound flywheel. This combined with a belt drive mechanism ensures smooth and stable ride. The magnetic resistance can be increased and decreased via tension knob. The seat can be adjusted both horizontally and vertically. The handlebars can be adjusted as well. The pedals have non-slip design and come with toe cages for comfortable and secured hold. The included LCD display features all the main features like time, speed, distance, scan and calories burned. The bike also features transportation wheels that are mounted at the front base. The Aceshin exercise bike supports maximum of 270 lbs () and the assembled dimensions are 42.9 x 18.9 x 43.3 in (L x W x H). Is Aceshin Exercise Bike Worth Your Money? Let’s start with the assembly. The good news is that bike comes mostly pre-assembled. You just need to attach pedals; handlebars and the stand and you got it. With the included manually it should not take you more than a few minutes. It’s easily doable by one person. The frame itself is very sturdy and will not wobble as long as you place it on an even floor. Thanks to the quality flywheel and belt driven mechanism the bike is very quiet. The seat itself measures 9.8 x 7.9 in (L x W) and is quite comfortable and a bit soft, which is definitely a plus considering most indoor exercise bikes include below the average seats. The magnetic resistance system allows for continuous resistance change, which is very good. One thing to note here, the one that several users complained about is the size of the tension knob. It is quite small and thus manipulating it during active ride can prove difficult. The handlebars are adjustable up to 37 inches (distance between pedals to handlebars) and the grip is quite comfortable. However, they do not include pulse rate monitor. The cell phone holder is included, so you do not have to buy one separately. The pedals are pretty standard, they have no-slip design and come with toe cage, however, they do not have SPD clips. As long as you are under 6’2” and you do not mind the smaller design of the tension knob, then Aceshin indoor exercise bike is definitely worth its price. It is a sturdy and affordable bike with great magnetic resistance levels.